Perfect-Every-Time Brownies from scratch – An easy, rich, fudgy brownie that’s perfect served warm with a scoop of ice cream or tucked in a lunchbox for a wonderful treat! 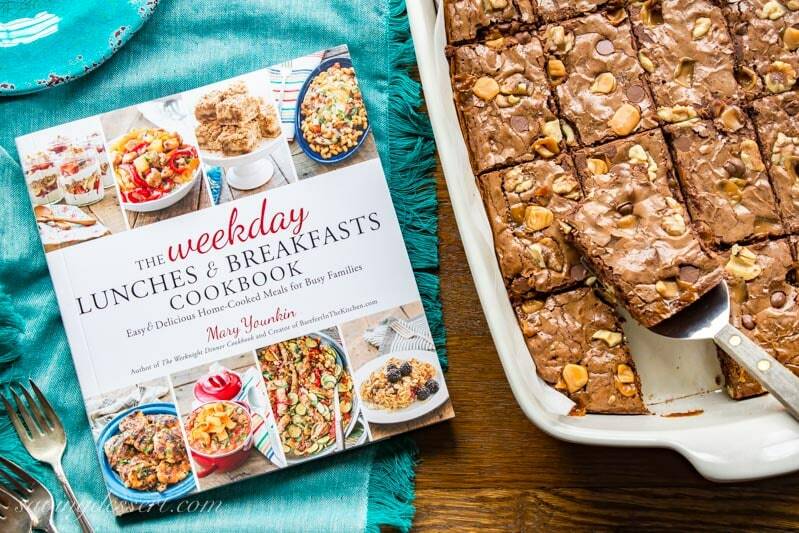 I couldn’t be more thrilled to share this wonderful recipe with you from The Weekday Lunches & Breakfasts Cookbook by Mary Younkin, author of The Weeknight Dinner Cookbook and creator of Barefeet in the Kitchen. Not only is author Mary a wonderful person in real life … she’s also an amazing cook, baker, writer and friend! Mary has a very generous nature, with both her time and knowledge. She’s hard-working, creative, sweet and positive, and I can say without hesitation her recipes are always delicious! Mary has a very soft spot in her heart for the hungry and homeless, and is never without sack lunches and bottled water in her vehicle to share in case she comes across someone in need. I’ve made more of her recipes over the years than from any other blog, which says a lot. If you take a few minutes to visit Barefeet in the Kitchen, you’ll clearly see her dedication to easy and delicious home-cooked meals for busy families. 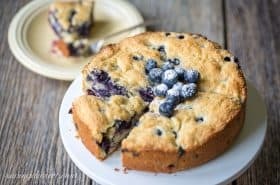 These brand new creative recipes are made with simple ingredients and easy techniques, with kid-friendly options that are both nutritious and delicious. You can tell a lot about a person by their favorite brownie recipe. Well, maybe not really, but in this case it’s obvious that Mary from Barefeet in the Kitchen knows how to make brownie-lovers super happy! With a shiny crackly top, these brownies from scratch are easy, quick, fudgy and chocolatey: all the hallmarks of the perfect brownie recipe. 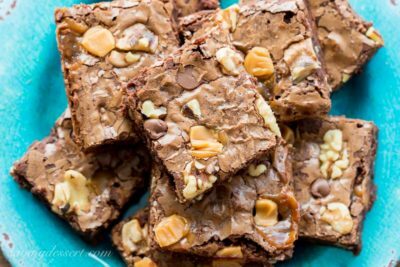 Mary even shares a list of add-in ideas to transform her delicious humble brownie into a decadent dessert. My add-in choices today are chopped caramel candies, a sprinkle of chocolate chips and my favorite … toasted walnuts. All you need is one bowl, a sturdy spatula and about 10 minutes to mix them up. 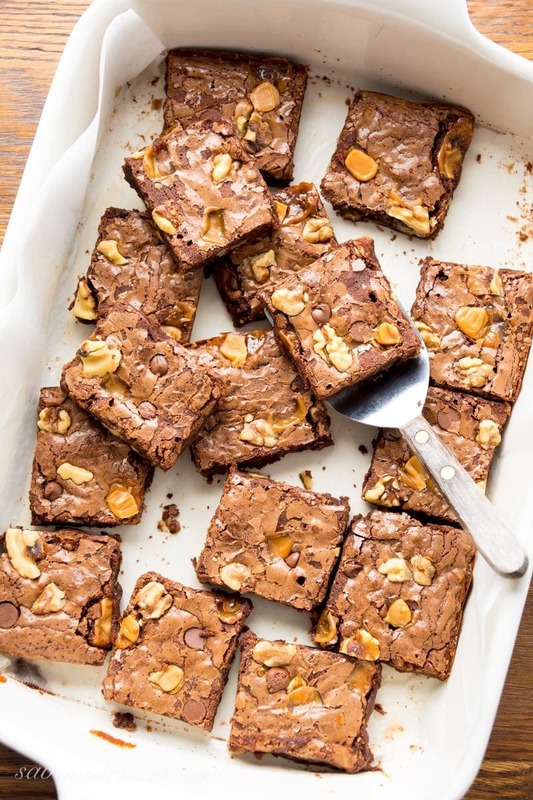 These brownies are baked in a 13 by 9-inch pan, but you can split the batter between two 8-inch square pans and customize each with different add-ins. Such a smart way to make everybody in your family happy! Next time I’m going to try adding a few salted peanuts and maybe some peanut butter chips too. I love an easily adaptable recipe and know you will too! This beautifully written cookbook is loaded with gorgeous photos that will inspire you to get busy in the kitchen. The cookbook is divided into sections for Quick and Easy Lunches, Make-Ahead Lunches, Quick and Easy Breakfasts, Make-Ahead Breakfasts, Sweet and Savory Snacks and Seasoning Mixes. 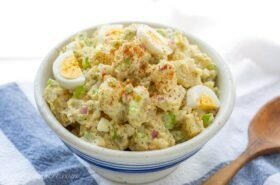 Next on my list of must-try recipes is Mary’s Last Minute Chicken recipe and the Asian Chicken Chopped Salad. I’m also going to make the Cheesy Bacon and Spinach Egg Cups and freeze them for a quick and delicious weekday breakfast. Mary also provides gluten-free alternatives for all her baked goods, bonus! Check out both of Mary’s wonderful cookbooks in the Amazon link below. Order your cookbooks today and grab an extra copy to gift to someone special. My daughter and daughter-in-law are going to love this new cookbook! An easy, rich, fudgy brownie that's perfect served warm with a scoop of ice cream or tucked into a lunchbox for a wonderful treat. Lightly coat a 13 by 9-inch baking pan with vegetable cooking spray. Cut a length of parchment paper to fit the pan allowing the paper to come up to the top on two opposite sides, creating a sling. Set aside. Combine the butter and 2 cups of chocolate chips in a heat-proof bowl. Set the bowl over a lightly simmering pot of water. Heat the chocolate and butter mixture until melted and smooth, stirring occasionally with a rubber spatula. Remove the bowl from the heat and stir in the brown sugar and vanilla; blend until smooth. Add the beaten eggs to the chocolate mixture and blend until incorporated. Add the flour and salt and fold together to combine. Gently fold in the toasted walnuts then pour the batter into the prepared baking pan. Sprinkle the top with the chopped caramels and chocolate chips, if using. 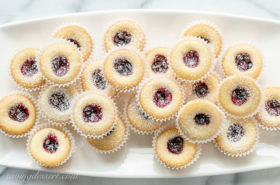 Bake for 30-32 minutes or until a toothpick inserted in the center comes out with a few moist crumbs, but no wet batter. Cool slightly before cutting. Serve warm or room temperature. These brownies also freeze well tightly wrapped for up to 3 months. Thaw at room temperature before eating. Check out both of Mary’s wonderful cookbooks available through Amazon. These affordable cookbooks make the perfect gift for busy families and anyone looking for creative and delicious recipes. We love a one-pan easy dessert and anything cut into bars is a winner! Check out these Outrageous Chocolate Hazelnut Blondies from The View from Great Island and our delicious grown-up Browned Butter & Bourbon Blondies. Don’t miss Mary’s Pecan Praline Blondies, with ice cream of course! And finally, I’ve been drooling over these Butterscotch Blondies with White Chocolate Chips from That Skinny Chick can Bake. So many delicious recipes to try! Those brownies look amazing! 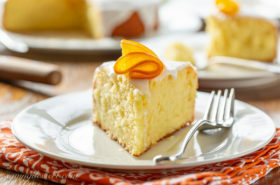 Congrats to Mary and her new cookbook and thanks for sharing her recipe! Thank you Susan. These brownies really are terrific. Mmm, brownies. Who can resist? Never met one I didn’t like, but of course some are better than others. And this one looks like the best of the best! Good stuff, and sounds like a neat book, too. Thanks! Looks delicious and I love brownies. Mary has become a serious foodie in the past couple of years – perhaps the next Ree. I know – Mary is absolutely amazing! Since one can never have to many brownie recipes to try, I am pinning this for future use. This cookbook sounds delightful but Mary even more so! Thank you for pinning Abbe! These are just perfect in every way. I’m so happy you enjoyed the brownies, Tricia! Your friendship is a gift. 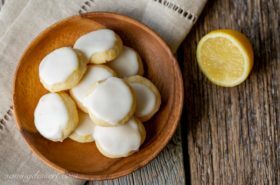 Thanks for sharing these wonderful recipes with us Mary. My copy of your cookbook has been “borrowed” by my daughter. I know she’s going to love it too – so I guess she’ll need her own copy! These really do look amazing, leave it to Mary! The three of us have been blogging buddies for so long 🙂 I got my cook book the other day and still can’t decide what to make! Can’t wait to see what you make from this lovely cookbook Sue – so many wonderful easy recipes! Lovely! Brownies are always a good idea 🙂 Sounds like a book I need to add to my collection! Both of these cookbooks look wonderful and the brownies, beyond wonderful! And so easy, I love it! We love easy and quick too Chris. Thanks so much! I’m so glad I have this cookbook, too! 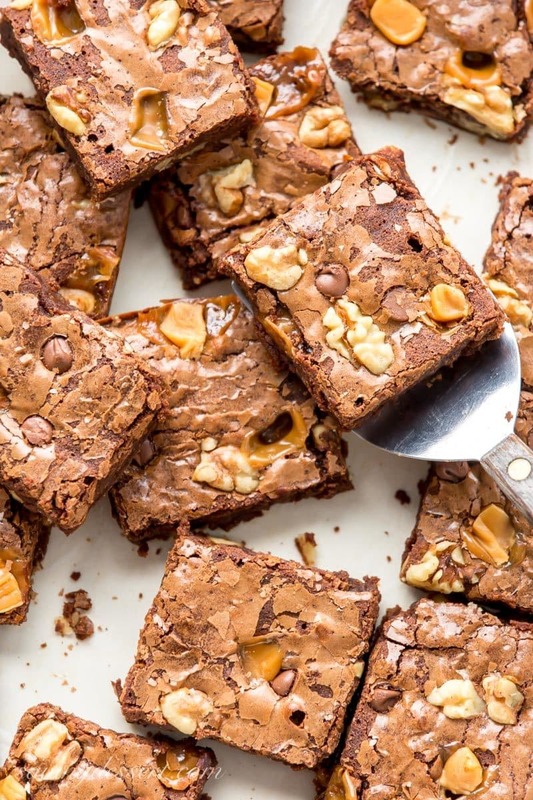 These fabulous brownies will be on my baking list! 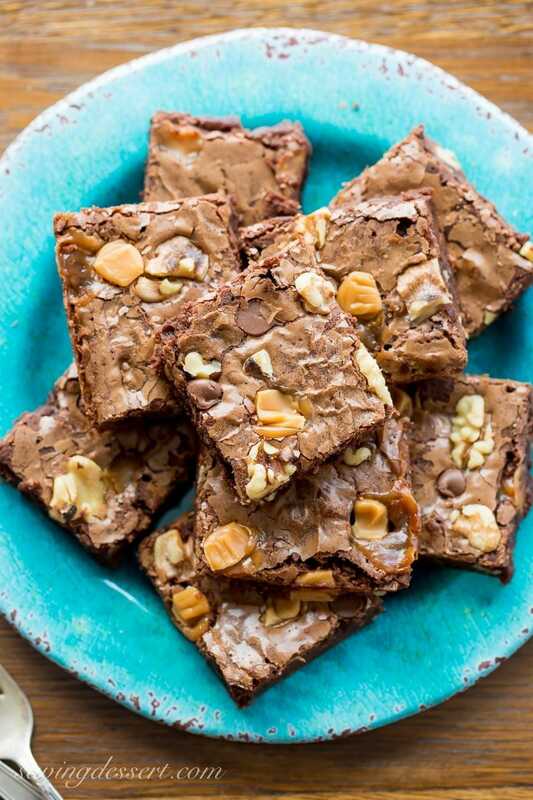 These brownies look beautiful and tempting with caramels! That thin crisp crust reminds me of my favourite brownie cookies 🙂 Happy Spring, Tricia!